UPDATED: Thu., March 15, 2018, 4:17 p.m.
Gonzaga was struggling to score late but Zach Norvell Jr. connected on one of the biggest shots of the season – a clutch 3-pointer that gave the Zags a 67-64 lead with 20.8 seconds left. Norvell added a free throw with 7.8 ticks left to seal the hard-fought victory. 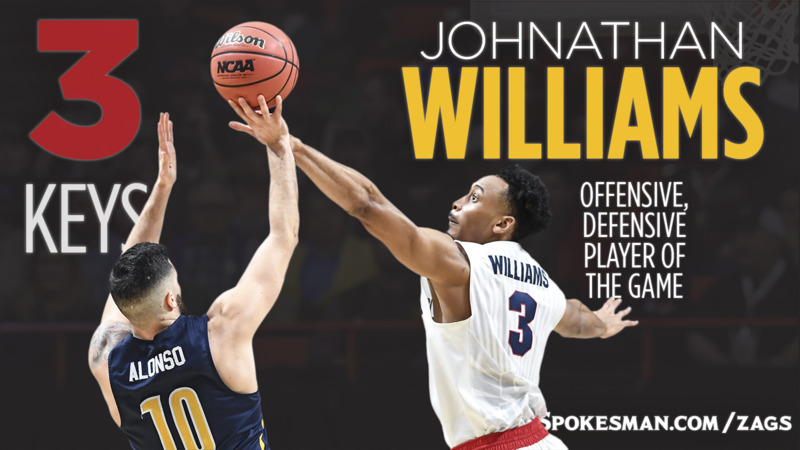 Senior Johnathan Williams delivered down low in a game where fellow forwards Rui Hachimura and Killian Tillie struggled. Williams finished with 19 points on 8-of-12 shooting. His point total would have been higher but he hit just 3 of 9 free throw attempts. Williams was stellar at the defensive end, helping shut down James Dickey after the UNCG forward had 10 first-half points. Dickey didn’t score in the final 20 minutes. Williams also collected 11 of his 13 rebounds on the defensive end. Published: March 15, 2018, 1:42 p.m. Updated: March 15, 2018, 4:17 p.m.